between Falls Road and Greenspring Avenue. Driving north on I-83, take the Ruxton Road exit. Turn left at the top of the exit ramp. Cross Falls Road at the traffic light. You will now be on Old Court Road. The entrance to the school is a 1/4 mile on your left. Take Exit 22, Greenspring Avenue. Head south to the intersection of Greenspring Avenue and Old Court Road. At that intersection, turn left. The entrance to the school is 3/4 miles on your right. After entering Park School Rd. from Old Court Rd., take first right, which winds behind the school. 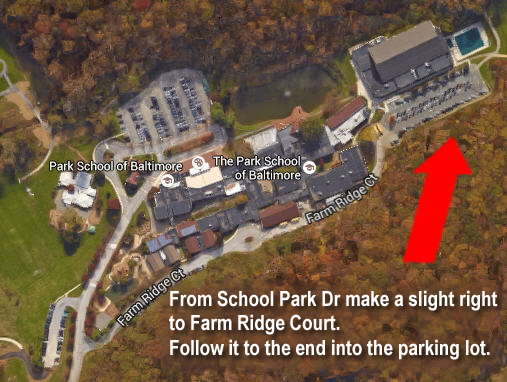 As you approach rear parking lot, Blaustein gyms are to your immediate left. (Alt)After parking your car in the front lot, follow the foot path past the duck pond, take the first right on the path and follow to the end. Blaustein Gyms A & B are on the left.